DRAWING ON THE STEEL WITH SOAPSTONE, MARKER, PENCIL TO SEE THE DESIGN WHEN CUTTING IS AN IMPORTANT FIRST STEP. 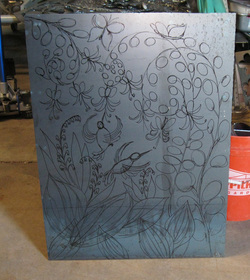 Drawings are made directly on the steel. Care must be taken to plan ahead so the cutouts and the remaining objects and shapes make an understandable picture! This is the decorative portion of a planter shelf. It is now ready to be plasma cut in the shop. 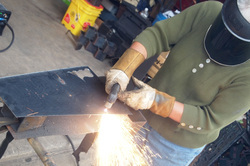 USING A PLASMA CUTTER TO REMOVE STEEL. 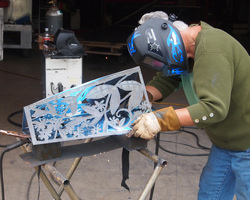 Switching to the hand plasma cutter allows for a smooth direct method of cutting the steel parts. 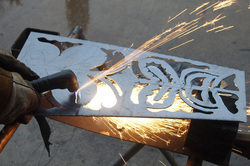 Unlike the tedious sawing in jewelry making, plasma cutting is convenient and fast. Care must be taken for protective clothing because sparks fly all over the place. Working on a flat surface minimizes this chances of getting burned. CLOSE UP OF THE PLASMA CUT NEGATIVE SHAPES AROUND THE POSITIVE DESIGN. Working carefully and logically, the positive drawing emerges as the surrounding negative spaces drop off the sheet. The resulting design can be very delicate and lacy or bold and geometric. Even if a mistake happens, it is possible to correct it by altering the design as the work continues. SPOT WELDING THE CORNERS OF THIS BASE TAKES TIME AND CARE. This three sided base is being assembled. Switching to a mig welder to fasten the sides together is exacting work. Different protective head-gear is needed for the process. Spot welding is all that is needed to hold the sides securely together. Once the piece is completed, all that remains is the surface treatment. 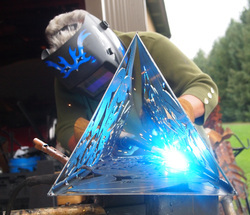 The metal has an oily surface which must be removed. If left untreated the steel would immediately begin to rust. Auto paint, gilderspaste, or clear spray paints are some of the possible methods to prevent natural rusting. Works can safely be left in the out of doors, but are equally at home indoors.